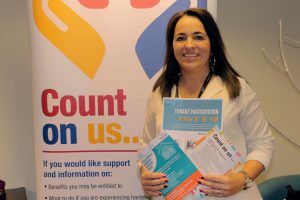 An event aiming to put money matters firmly on the tip of the tongue and get people talking was held in Arbroath on Friday 16th November, organised by the Angus Financial Inclusion Partnership. Taking place as part of the Talk Money Week, the “What’s the Benefit” event welcomed around 70 attendees, from a range of organisations including Hillcrest, Scottish Government, Scottish Social Security, Citizen’s Advice, the Angus Council Education Department and Angus Carer’s Centre. With financial wellbeing consistently a hot topic, this event sought to improve services and referrals throughout the various partner organisations involved. By encouraging conversation around money, the aim was to focus on what organisations can do to get more people accessing free information that can help improve their financial situation. This includes debt advice, how to save regularly, educating more young people on money and budgeting, and getting fewer people dipping into credit schemes for everyday spending. While financial wellbeing took the limelight, attendees also took part in three sessions, hearing from speakers on the topics of mental health, digitalisation and The Child Poverty (Scotland) Act 2017. If you are a Hillcrest tenant and struggling with any money issues such as debt, budgeting, energy bills, then you can get in touch with Hillcrest’s dedicated Tenancy Sustainment Team who can offer a range of help and advice. Get in touch with us now on 0300 123 2640, or by email at customerservice@hillcrestha.org.uk.